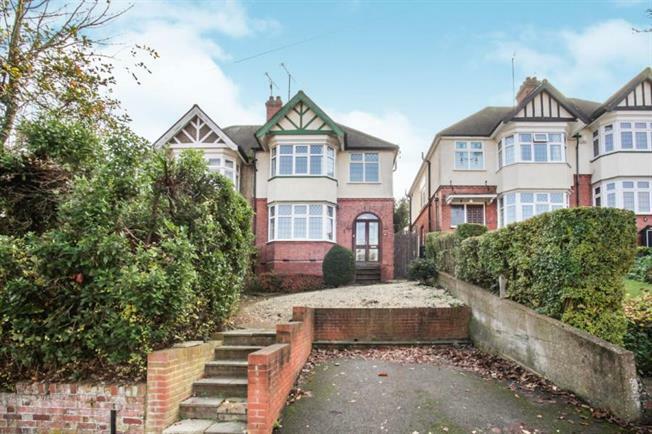 3 Bedroom Semi Detached House For Sale in Luton for Asking Price £350,000. This deceptively large family home is simply stunning, located on the highly desirable Cutenhoe Road situated just a few minutes drive from M1 J10 and with easy access to Harpenden and St. Albans, this could be the forever family home that you have been searching for. This immaculate home has been fully refurbished throughout and comprise of a large bay fronted living room, spacious dining room with patio doors opening onto the rear garden, modern fitted kitchen, three double bedrooms and a family bathroom. Externally the property has a large rear garden which is mainly laid to lawn, off road parking to the front and a garage to the rear. Call now to arrange a viewing and truly appreciate what this home has to offer. Walk-in bay window to front, feature fireplace, double radiator, picture rail, coving to ceiling. Fitted with a matching range of base and eye level units with worktop space over, stainless steel sink unit with single drainer, oven and hob. Window to side, radiator. Double glazed window to rear aspect, double radiator, carpet. Refitted with three piece suite comprising 'P' shaped bath with independent shower, pedestal wash hand basin and low-level WC, double glazed obscure window to front, heated towel rail, fully tiled floor and walls.